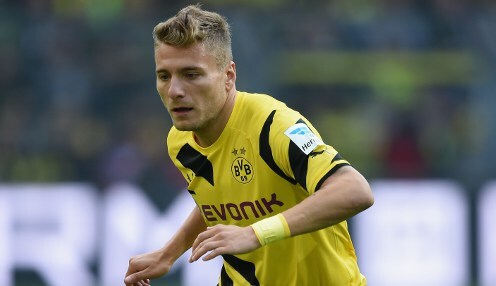 Borussia Dortmund's Italian striker Ciro Immobile says he is honoured to be linked with a possible return to his homeland to join Napoli. The 25-year-old moved to Germany a year ago from Torino, but struggled to make his mark at the Westfalenstadion, scoring just three goals in 24 Bundesliga appearances. Clearly it is pleasing to be linked with important clubs and this fills me with pride. Italy international Immobile fared a little better in Europe, scoring four times in the Champions League as Dortmund reached the knockout stages before being knocked out by eventual runners-up Juventus. However, his future with the German outfit remains uncertain and Immobile has certainly not ruled out a move away for Borussia this summer. He told Sky Sport Italia: "Clearly it is pleasing to be linked with important clubs and this fills me with pride, as it means all my hard work actually meant something. "In a little while the pre-season training will begin in Germany, then we'll see what happens. "It's only natural that I am pleased with this rumour. I get emotional at the idea of being linked with Napoli, let alone wearing the club shirt." Dortmund have appointed Thomas Tuchel as their new head coach following the departure of Jurgen Klopp, with the former Mainz man having to plan for Europa League football after BVB managed to finish seventh in the table after enduring a terrible first half of the season. Borussia can be backed at 1/1 to win the Europa League next season, with Napoli 1/1 and Fiorentina 1/1. Use bet365 On The Move with a mobile or tablet and claim a 100% bonus when you place your first bet. T & Cs apply. Don't forget, all Serie A matches are covered by the bet365 Euro Soccer Bonus, where you could earn a bonus of up to 100% on your returns on pre-match accumulator bets. T & Cs apply. Including the Champions League and Europe's top domestic leagues. Only available to new and eligible customers. T&Cs apply. For Correct Score, Half-Time/Full-Time or Scorecast bets if final score 0-0. Only available to new and eligible customers. T&Cs apply. We will pay out at 1/3 odds for unlimited places in 90 minutes play.